This is a weird little book. It’s a Twilight Zone sort of homage with this constant sense of terror around the corner. Once you finally find the terrible thing though, it’s nothing like what you expect and things just keep getting weirder and weirder. As the beginning of a trilogy, Annihilation sets the stage for some bizarre adventures in a strange world, but instead comes away as an emotional character arc with plenty of emotional tension, but perhaps lacking a bit in plot or action. I’ve tried writing this review several times since I read the book some time ago. It’s a weird book and it left me with weird feelings about it. At times I felt dumb for being bored by its lingering analysis of character emotions and back story. Other times I was genuinely creeped out by the mysterious Area X and all the bizarre things that seemed to be happening right outside the corner of the narrator’s vision. 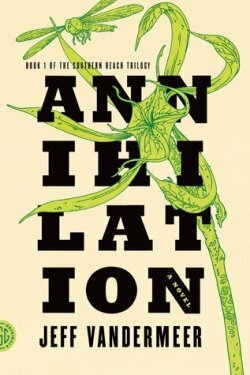 There is a lot in Annihilation and I feel it would take another read through or two for me to fully grasp what it is VanderMeer has created. With an unreliable narrator telling a story from the first person, it’s a challenge to tell what is real and what is just some twisted version of reality. It’s a strange book from beginning to end and, while it’s a quick read, it has meat on its bones that deserve some time to be picked at and consumed. I don’t know if I’m going to move forward with the rest of the series, but I’m intrigued to do a bit of digging to see what other people have thought of the series.